If you are working in the travel, tourism, and hospitality industries, you are probably already aware that people travel for leisure, business, relaxation, and other purposes. Within these travels, the need for an itinerary is very important especially for the purpose of evaluating budget proposal examples, calculating estimated travel costs, and maximizing one’s time in the location where he or she will be going. 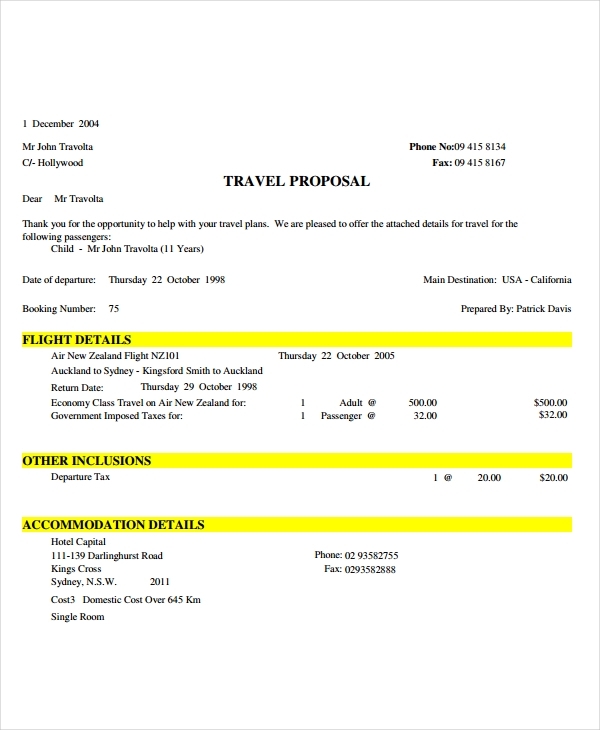 Creating proposal examples in PDF or in any other software can help you provide information on how the travel needs of entities can be supplied. As a travel agent, an agency, or an entity who offers travel programs and deals, it is essential for you to know how to write a proposal that can get the attention of your current and potential clients. 1. Academic institutions send a travel proposal to their students who would like to immerse in an internship abroad. 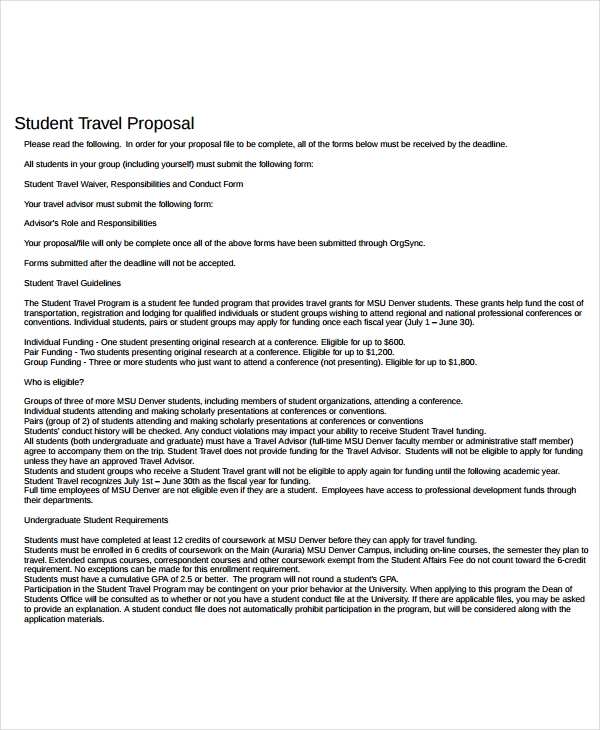 Like service proposal examples, travel proposals that are created in this manner also provides information about the services that the school can provide the students with once they already start with their internship. 2. Professionals make a travel proposal to give an idea about the costing of their business trip. This is very important especially for accounting and auditing purposes. Once the travel proposal of an employee has been approved, then the finance department can already prepare the amount of money requested either for disbursement or reimbursement. 3. Event organizers sometimes need to create travel proposals as a part of their professional services proposal and agreement with the clients. This is commonly observed during out-of-town work engagements like destination weddings. With this, event organizers must be aware on how to make an event planning service proposal where a comprehensive travel proposal is incorporated. 4. Individuals and nonprofit organizations also write a travel proposal if they would like to gather funds for a particular travel with the purpose of helping others, volunteering or taking part of an activity or a program. 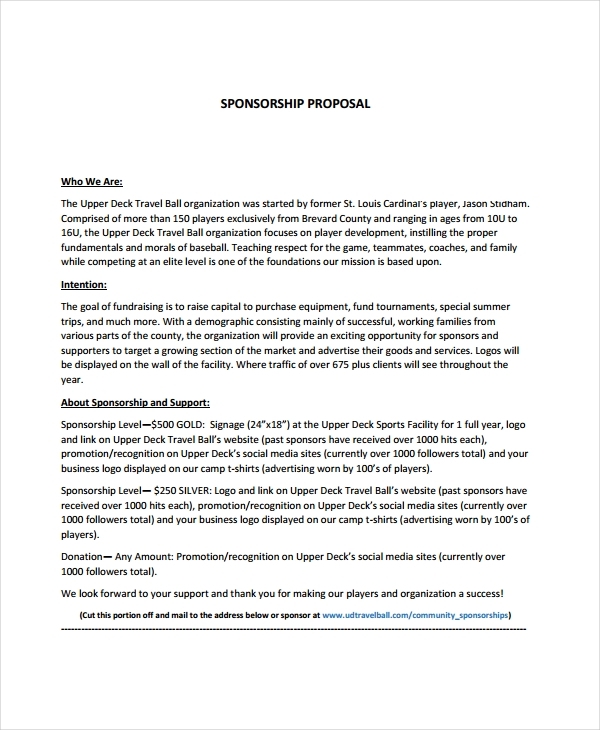 Sponsorship proposal examples can be used as a reference with regards this matter. As a travel agency, you have to make sure that you are knowledgeable on how to write a business proposal for customers where concerns, inquiries, questions, and demands are fully considered and answered. It is important for you to identify all the details that you will include in a travel proposal as well as the ways on how you will put these items together for a clear and understandable discussion. If it is your first time to create a travel proposal, it may be a little overwhelming for you to start the development of the document. However, knowing the basics of this activity can help you a lot especially if you will have references at hand. Moreover, being aware of helpful tips and guidelines can impact the creation of your travel proposal positively. You may also see investment proposal examples. Listed below are some of the tips that you can follow if you want to create an outstanding travel proposal. 1. Make sure to not over-promise. 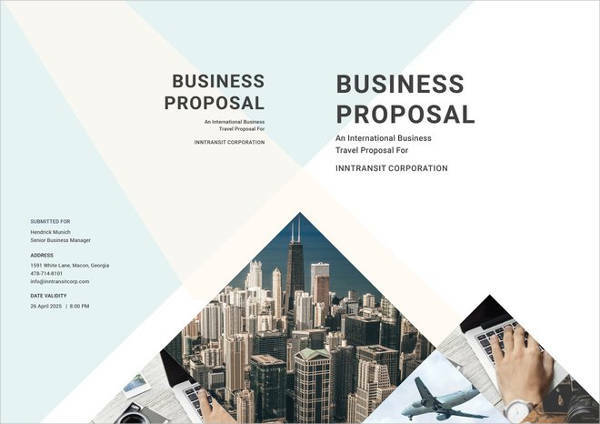 This goes not only for travel proposals but also for security proposal examples, business proposals, and all kinds of proposal documents that will represent your business and what you can bring to the table. 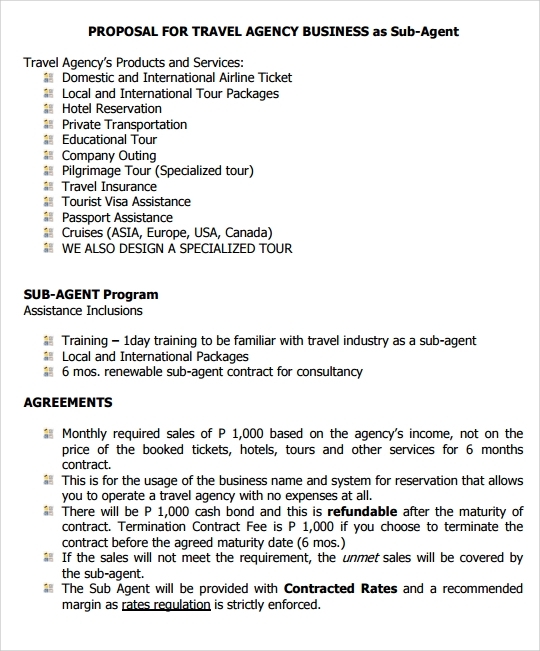 Write down details in the travel proposal that are measurable and attainable. Your deliverable must match the items that you will put in the document so that no misunderstandings and failed expectations will occur once the travel proposal has been approved. You may also like conference proposal examples. 2. 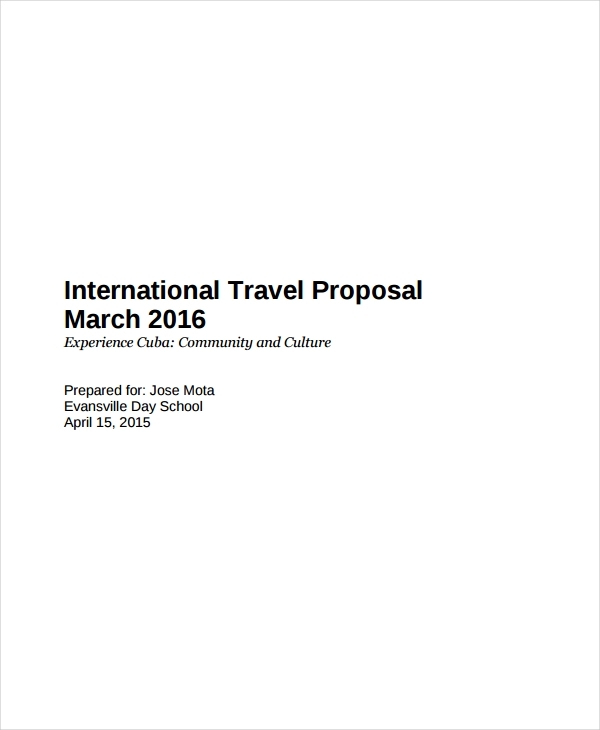 Create a travel proposal just like how you write business proposal examples and samples. This way, you can ensure the formality of the document. It is important for you to remember that travel proposals can make or break a business deal with your clients. Hence, you must develop this document in a professional manner. 3. Review the final draft of your travel proposal before sending it to your clients. You have to make sure that the travel proposal document is error-free so that it can look more impressive. The format of the document must also be looked into so that you can make sure that any reasonable person can find the travel proposal understandable. 4. Know the purpose on why you need to create the travel proposal. This will guide you when listing down all the content of the document. More so, this can help you highlight all the details that your client must focus at. This way, you can give importance to the information that can separate your travel proposal from other kinds of travel proposals. You may also check out partnership proposal examples. With the tips and all the information specified above, it will already be easier for you to come up with a travel proposal. Do not be afraid to commit errors and mistakes as these are parts of the learning process. Moreover, there are references in this post that can guide you within the entirety of your travel proposal creation activity. You may also see landscaping proposal examples. 1. If request for proposal examples are available, make sure to review these documents first. You have to create a travel proposal that is based on the needs of your target audience. 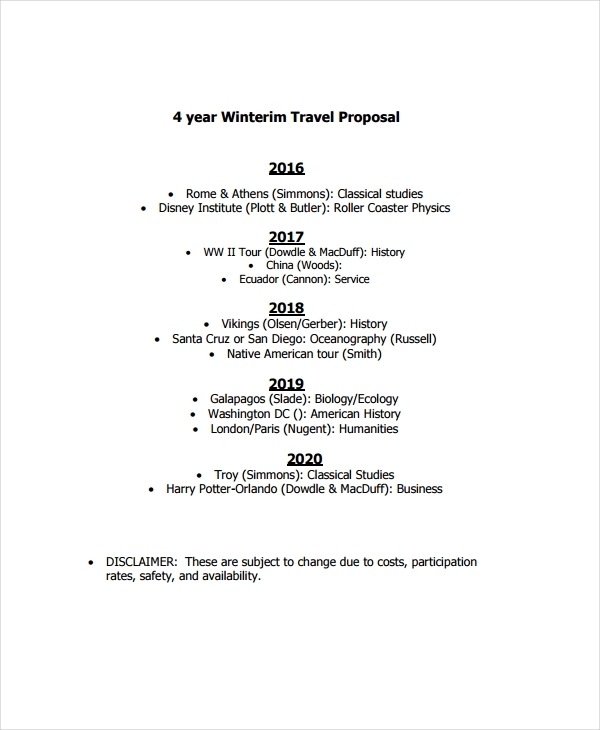 This can make the travel proposal more effective and impressive. 2. Start by listing down all the details that you need to include in the document. Having a checklist or an outline can help you plot out all the information that are considered necessary to be a part of the travel proposal. 3. 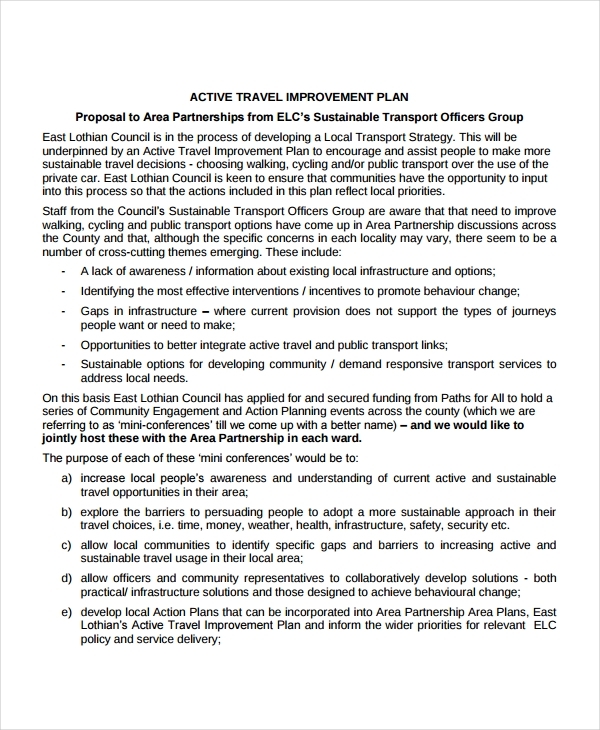 Search for examples of existing travel proposals. There are different kinds of travel proposal examples that you can download and look into from this post. If you have examples at hand, it will be easier for you to know how to properly develop the flow of your travel proposal discussion. You may also like software project proposal examples. These examples can also help you identify the items that you still need to include in the document aside from the initial details that you have already listed. 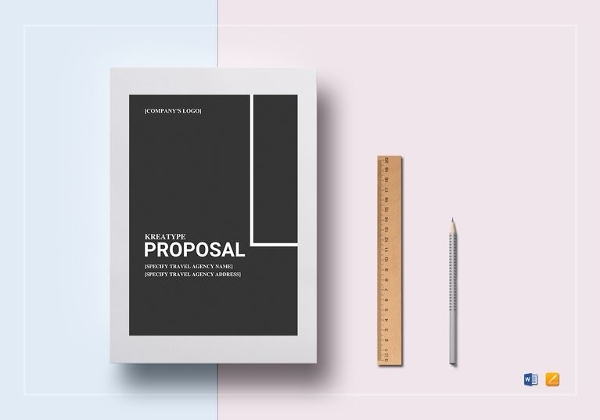 Referring to professional proposal examples and samples can also help you a lot when it comes to the fast and easy development of your own travel proposal. 4. Use templates if you do not know how to format the document in a formal or business-appropriate manner. No matter how good the content of your travel proposal is, these information will be overlooked if you will present them in a lousy and hard to understand manner. Your document presentation matters a lot so you should allot time when creating and evaluating the layout of your travel proposal draft. 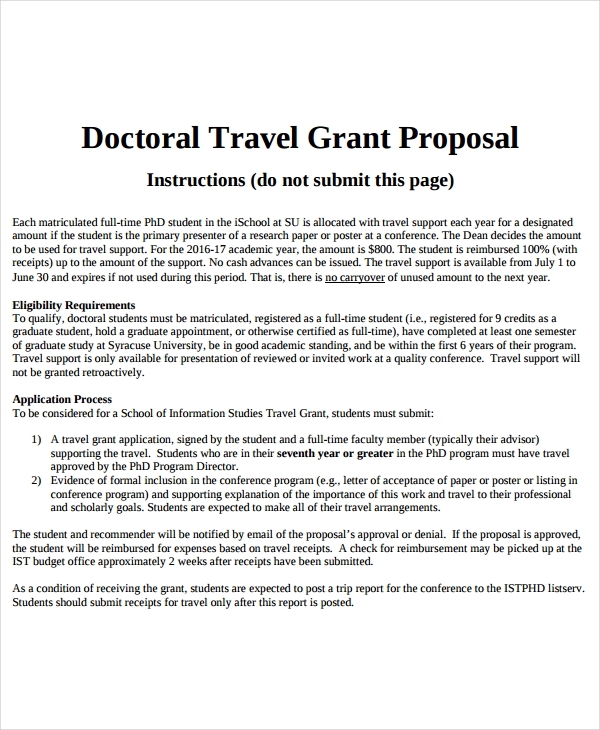 You may also check out proposal memo examples. 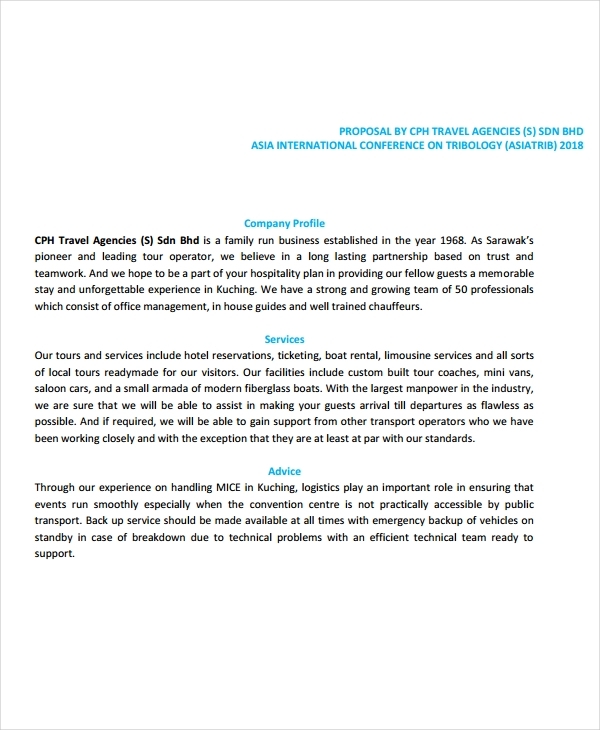 It is recommended for you to get the comments and recommendations of your teammates or other entities who are aware on how to develop a functional travel proposal. Getting insights from other people can help you further develop and improve the document. Start making your travel proposal and see or experience how the guidelines and examples in this post can give you the formatting and content development help that you need. You might be interested in policy proposal examples.